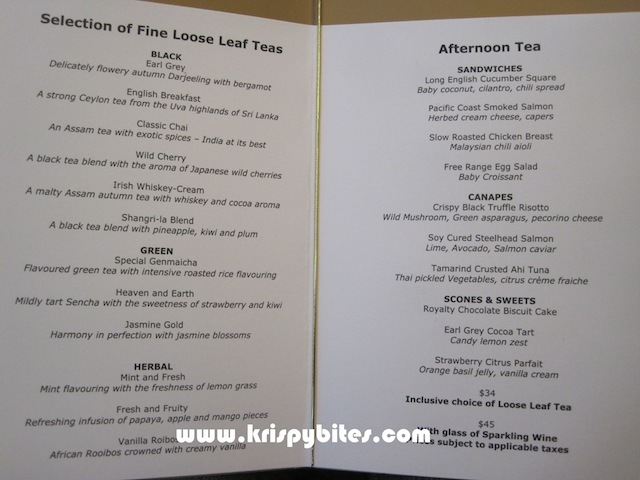 Just like the Fairmont Pacific Rim, Shangri-La also has a Lobby Lounge that serves afternoon tea daily. It was quiet when we got there with just one other table occupied. I was very impressed with how new and squeaky-clean the tea set was compared to all the other afternoon tea places I've visited. I remember the plates and teacups in Hotel Vancouver looking yellow with age and sporting patches of tea stains. Other restaurants replaced parts of the set with other patterns, probably after breaking the original ones. But all the tea sets here were complete and sparkly new. 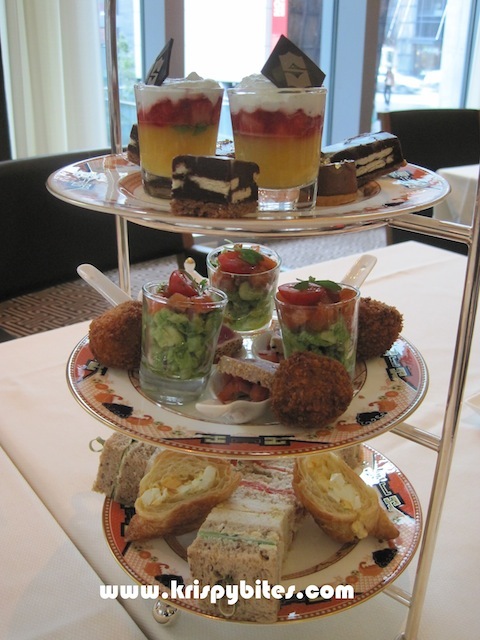 The afternoon tea service is $34 per person, and offers a variety of sandwiches, canapes, scones and sweets. The menu changes every month or it might stay the same for a few months if it's popular. 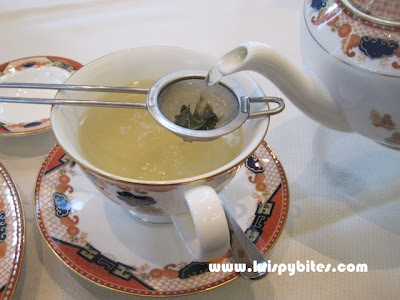 When I go for afternoon tea, I tend to order green tea because I find that black or milk tea is usually too heavy and takes away from the flavour of the food. I chose Heaven and Earth, a "mildly tart sencha with the sweetness of strawberry and kiwi". 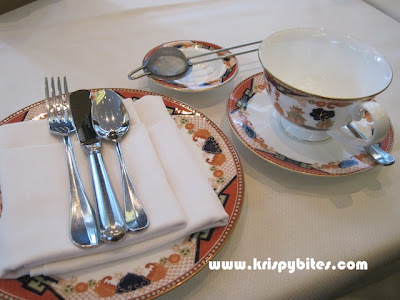 The tea was comparable to the tea at Hotel Vancouver, with a very smooth and creamy finish. The tea strainer was a thoughtful implementation as it prevented the tea leaves from falling into the cup, resulting in a clear liquid that was crisp and clean with strong fruity tones. 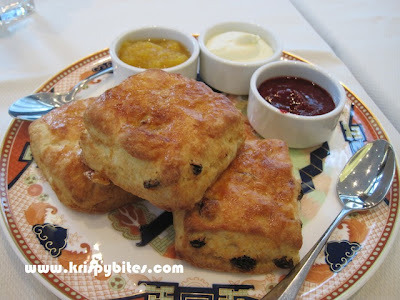 Scones were served warm with mango puree, Devonshire cream and raspberry puree. The mango puree had little black specks inside which I suspect to be vanilla beans. It was sweet and slightly tart with a rich fragrant flavour. The raspberry puree was sweet-tart as well with a very smooth texture. I went for one of the raisin scones (the other one was plain) and noticed there were 2 types of raisins inside. I liked the contrast between the sweeter golden raisins and the fuller-bodied dark raisins. The scones were not the super light and fluffy kind that falls apart easily. They were more substantial in texture, but still soft on the inside with a crispy crust. The 3-tiered tower came with finger sandwiches on the bottom tier, canapes in the middle, and desserts on top. It was evident in the presentation that all of the items had been prepared with a lot of care and detail. 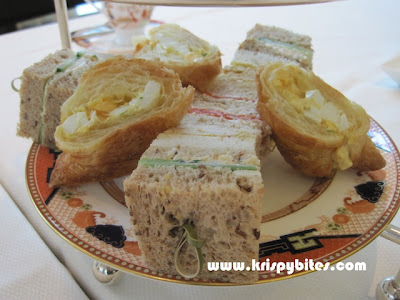 Each of us got an egg salad croissant and a bamboo skewer of 3 sandwiches. I especially liked the croissant as it was very fluffy with beautiful layers and the egg salad filling was light but not bland at all. The sandwiches were all pretty good because the ingredients inside were fresh. The bread was soft and moist enough, but not as soft as the bread at Hotel Vancouver that literally deflated as I bit into it. The middle tier was inspired by cuisines from around the world. This was my favourite tier! 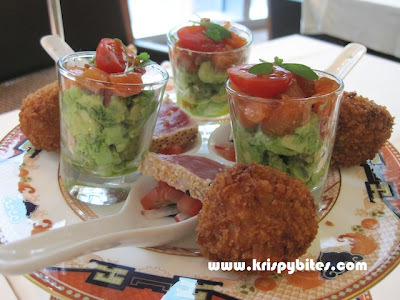 I LOVED everything on this tier, from the deep fried risotto ball to the refreshing seared tuna and the rich buttery guacamole. The risotto ball looked hard and dry, but the inside was filled with gooey melted pecorino cheese, asparagus, wild mushroom, and a bit of black truffle. The ahi tuna was served on a spoon atop a bed of Thai pickled vegetables that brought out the flavour of the tuna without taking away from the taste. The tropical vegetables combined with the aromatic sesame seed crust complemented the fish perfectly. The guacamole came in a small glass with diced soy cured salmon and cherry tomato, and seasoned with a hint of fresh lime juice. The desserts were all up to par as well. I started with the layered fruit parfait that had slices of mandarin orange and jelly on the bottom, basil and strawberries in the middle, and vanilla cream on top. Finally it was decorated with a chocolate square bearing the Shangri-La logo. 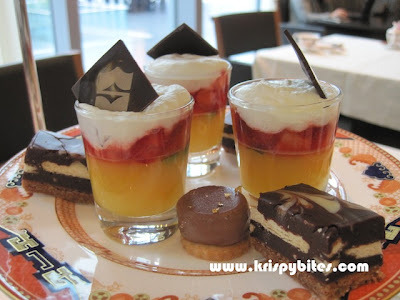 It was a cooling and thirst-quenching dessert perfect for cleansing the palate after the savouries. Next I had the earl grey tart sprinkled with tiny sparkly flecks of gold. I was never a fan of earl grey, so I was surprised that I actually enjoyed it. The brown earl grey cocoa ganache on the biscuit had an interesting texture that was much lighter than regular ganache and somewhat similar to chocolate pudding. My least favourite food item of the day was the chocolate biscuit cake because I found it overwhelmingly sweet. It tasted pretty good, but it was difficult to appreciate the flavour when the sweetness was so overbearing. The Lobby Lounge at Shangri-La also features a Fazioli piano, and there's a pianist performing every Saturday and Sunday from 2:30 to 4:30 pm. We caught the beginning of the performance near the end of our meal, and the pianist came over to ask if we had any song requests. It was a nice touch to the tea experience. From the ambiance to the service to the food, Shangri-La is one of the best afternoon tea venues I have visited to date.